Alas the gluten-free Korean Baby is crisp, light, savory, but not as puffy as its wheat counterpart. I'm OK with that. Round six... ding... I’ve been busy revising a few gluten-free recipes—one of them a savory baked pancake made with kimchee called the Korean Baby (above). 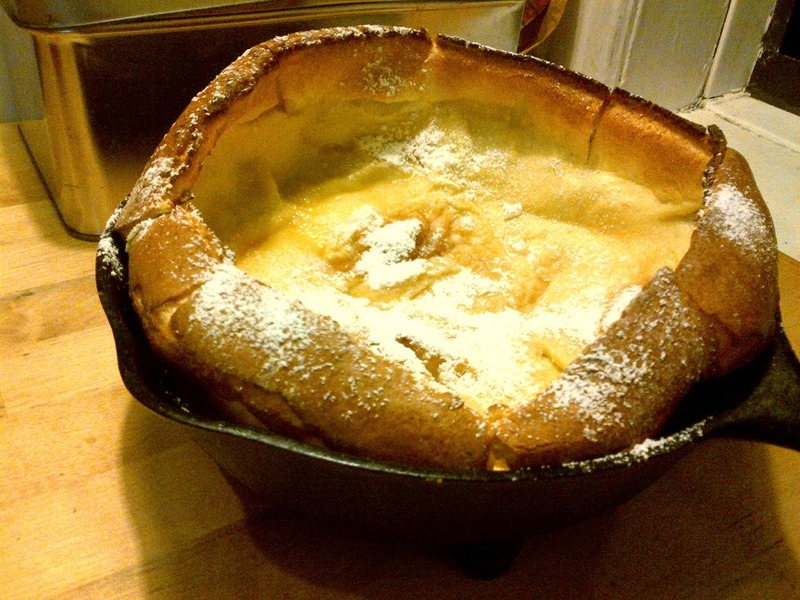 It’s based on the Dutch Baby (shown, page bottom)—aka German Pancake, Dutch Puff or Bismark. I think it’s rather funny how most Brooklynites have never heard of a Dutch Baby, considering that Breukelen was settled by the Dutch. Much like its hearty Yorkshire Pudding cousin, a classic Dutch Baby magically puffs, rising high and lofty like a poet with a Ph.D., but quickly deflates as it cools... more or less like any poetry slam. So what makes it puff? Mainly egg protein and the gluten in wheat flour. As hot fat turns milk into steam, egg protein and gluten trap steam causing the batter to rise up and over the pan’s edge. No rise or low rise? I've had little luck using ceramic ware; the crust never sets up properly. Metal performs much better. I found that a well greased cast iron pan works best; the batter starts cooking once it hits the hot metal. Ceramic ramekins don’t conduct or distribute higher temperatures as well as metal; results are either hit or miss for this type of pastry, but good for baking soufflés. The Dutch Baby’s American cousin, the popover, is baked in specialized conical tins which allow the batter rise even higher forming a puffed cap as it bakes. The temperature of some ingredients is important—eggs at room temperature, milk warmed and butter melted. This ensure that the batter will mix evenly. Popovers, Dutch Babies, French crêpes and Yorkshire Pudding all basically use the same ingredients but vary by ratio of milk, fat and flour. Salt plays an important role in baking, but not just for balancing flavor. It actually strengthens gluten, making it stickier; it also helps baked goods brown evenly. All-purpose (AP) and cake flours have the least amount of gluten ranging anywhere from 8 to10%; pastry flour contains 9 to 10% gluten. All these result in a softer pastry. Whole wheat flour has a low rise. Although it’s higher in gluten, the bran particles interfere with formation of long gluten strands. Too much fat and sugar in the batter will also prevent gluten from forming long chains—hence, the pound cakes dense body. The gluten-free batter that I’ve been experimenting with yields only a modest rise with the help of little baking soda. I’ve played with a few flour combinations, but after making six gluten-free versions I’ve accepted that science has dictated that it shall never puff as high. This gluten-free version may not make it into the Kimcheelicious ePUB cookbook, but it made it to my plate. Oh, poor me, eating all my baked failures... nom, nom, nom... sob. In the meantime, I’ll make another traditional Dutch Baby for dessert. Eggs should be at room temperature, remove from the fridge an hour ahead or rest them in warm water for 5-10 minutes. Preheat oven to 450°F. In a cast iron skillet add 3 tbsp of butter, place in oven to melt. In a small pan, warm milk until small bubbles form at the edges, or microwave on high for 5 seconds. In a large bowl whisk milk, salt, sugar, vanilla and eggs together. Add flour 2 tbsp at a time while whisking, then add the melted butter. Mix until smooth; small lumps are fine. Take hot skillet out of oven and add 2 tbsp of butter, coat the sides and bottom of the pan evenly. Carefully pour batter into the pan and return to the oven. Bake at 450°F for 20-25 minutes, or until the Dutch Baby puffs over the edge of the pan and browns at the top. Place skillet on a trivet to cool. Mix maple syrup or honey and lemon juice and brush top and sides. With a small fine sieve, dust with powdered sugar. Serve immediately while it’s hot. A Breukelen Dutch Baby is delivered—pamper with maple syrup and lemon and dusted with confectioner's sugar.